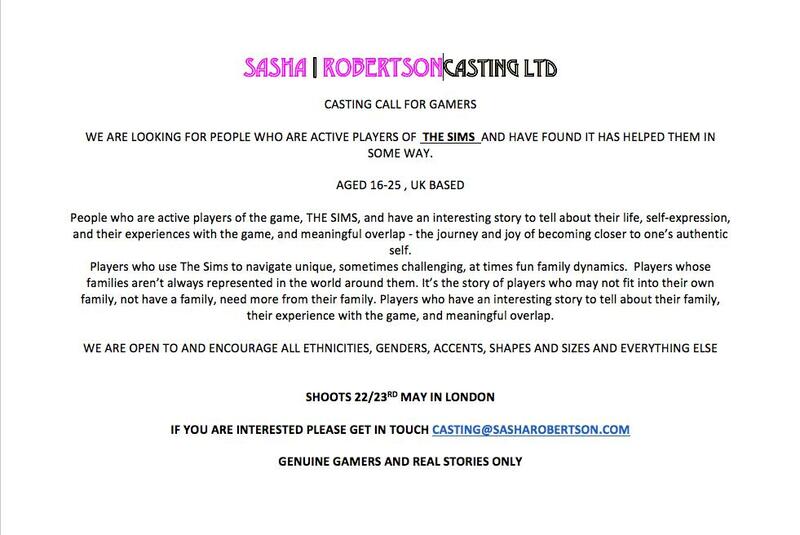 Sasha Robertson Casting, a renowned casting agency based in London, United Kingdom is holding a casting call for an upcoming official The Sims video! This casting agency that helped find great talents for multiple commercials including Amazon, Vogue and even helped find talents to be featured in Taylor Swift + Zayn’s “I Don’t Wanna Live Forever” music video are now looking for people to be featured in The Sims’ upcoming video / commercial! The Sims gives players a platform to explore how they express themselves in the real world. Through testimonial, we’ll capture these stories and celebrate self-expression, and the journey and joy of becoming closer to one’s authentic self. Active players of the game, THE SIMS, and have an interesting story to tell about their life, self-expression, and their experiences with the game, and meaningful overlap. These are the stories of players who use The Sims to navigate unique, sometimes challenging, at times fun family dynamics. It’s the story of players whose families aren’t always represented in the world around them. It’s the story of players who may not fit into their own family, not have a family, need more from their family. Active players of the game, THE SIMS, and have an interesting story to tell about their family, their experience with the game, and meaningful overlap. Genuine gamers and real stories only! The castings session will be held in London on 30th of April / 1st of May. Those who get accepted to be a part of this Sims video / commercial will be paid 1000 US Dollars! It’s currently not known if this casting call / testimonial opportunity will be available in other countries around the world but we’ll definitely keep you posted! Are you interested in sharing your testimonial about The Sims and how it has affected your life? Click the button below for full details! I agree 100%. I am 14 years old and have had so many good experiences with the sims. First off, this game has made me want to continue in a path with architecture. Also… I CANT LIVE WITHOUT THIS GAME . I definitely agree with the age limit. That age requirement I call BS. Sims players, who started playing Sims when it came out, are OVER 30 ALREADY! Sure, limit to a certain region, but you shouldn’t put a limit stopping at 25. I think most 25yr olds, certainly those younger, have never played Sims 1. @Jarred, you bring up a good point!